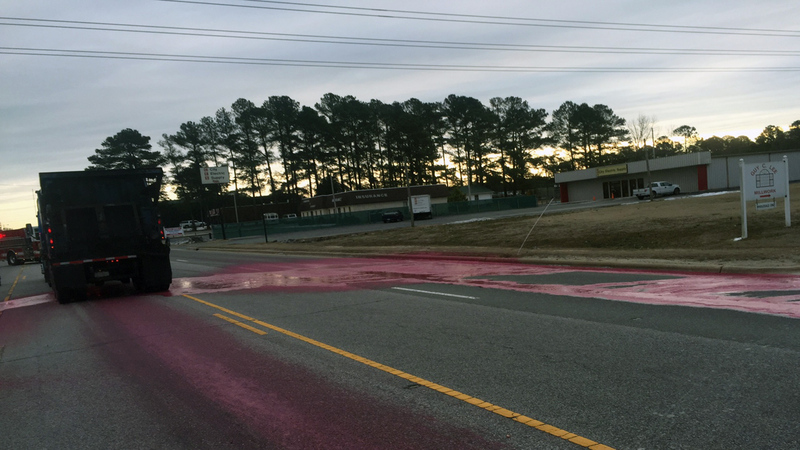 SELMA, N.C. (WTVD) -- A Valley Proteins tanker truck carrying restaurant grease sprung a leak in Selma Saturday morning. Officials say something punctured the tank in the area of I-95 and U.S. 70. The driver didn't notice for a mile and finally came to a stop on Highway 301 between U.S. 70 and Ricks Road -- in front of the Selma Police Department. The tank emptied completely after having made four pickups Saturday morning. The grease leaked across all five lanes of Highway 301. A cleanup crew was sent to help and DOT is assisting with traffic. ABC11 crew on the scene said lots of sand was spread over the leak trail. Officials say the material is not hazardous and does not pose an environmental threat but smells unpleasant. Highway 301 is expected to be closed for most of the day.